In addition to a new Photos app and emoji improvements, yesterday's developer release of the first OS X 10.10.3 beta also includes new direct support for Google's 2-Step Verification when setting up Google services in the Internet Accounts section of System Preferences. 2-Step Verification is an optional security setting that requires users to enter not only their account password but also a unique code sent by Google via phone app, text message, or voice call to a previously registered device or phone number, greatly enhancing account security. Not all devices and apps support Google's 2-Step Verification, however, and as a backup Google also allows users to generate app-specific passwords to register a unique password for that device or app. The app-specific password can be revoked at any time by logging into the user's Google account for another time, making it easy to disable access on a device that has been lost or stolen. On OS X 10.10.2 and earlier, users setting up their machines to access Google accounts with 2-Step Verification enabled have had to use this app-specific password option. Users trying to log in with their standard Google account passwords are met with error messages informing them they need to use this option. 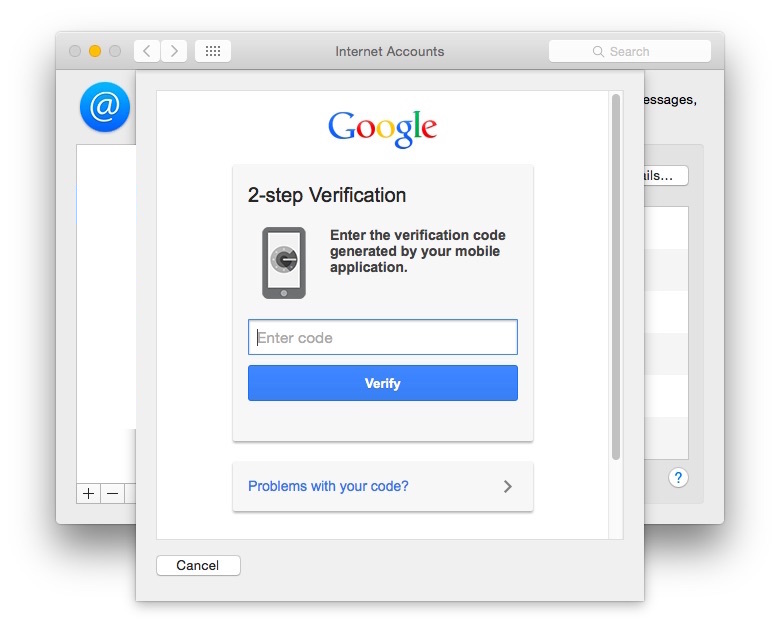 But as noticed by developer Jonathan Wight, the new OS X 10.10.3 beta now fully supports 2-Step Verification, allowing users to log in with their standard passwords and unique verification codes. The change makes logging in with 2-Step protected accounts much simpler and increases security by making sure the user attempting to log in has a secondary trusted device to provide the verification code. Please, you expect us to believe that anybody at Apple has been doing anything besides working on Emoji? I have an Apple Airport Extreme router. After my iMac wakes from sleep, I often cannot connect to Wi-Fi, even with OSX 10.10.2. And yet my iPad and iPhone connect perfectly every time. What does this tell you? Apple gets it right with iOS, but they are no longer putting the resources into Macs and OSX. It shouldnt take this many months to get the bugs out of a new OS. The "webpage-inside-a-sheet" look looks pretty lazy, but it is a beta. I could be wrong but I think it needs to be that way to hand control over to Google to do the authentication. That's the same thing you'll see in any application that supports their 2-factor setup. I have an Apple Airport Extreme router. After my iMac wakes from sleep, I often cannot connect to Wi-Fi, even with OSX 10.10.2. And yet my iPad and iPhone connect perfectly every time. What does this tell you? Apple gets it right with iOS, but they are no longer putting the resources into Macs and OSX. It shouldn’t take this many months to get the bugs out of a new OS. It doesn't tell you anything. Everyone has different experiences...for me, iOS 8 is way buggier than OS X, especially Safari. There should be a 2 step verification process for everything. Um, the point of authentication like this is to contact the source directly instead of giving your credentials to a third party. How else do you expect them to do this? They could easily provide a native interface that communicates directly with Google. Why would you assume they couldn't? Of course he bought an iMac to go back to the Middle Ages. Honestly think it is not Apples fault. He must be holding it wrong. Customers are paying top dollar and get an OS/hardware combination that does not work. Wifi and DNS are horrible examples. Customers should not put up with this and certainly not accept workarounds as an acceptable solution. There is no excuse for getting wifi and DNS wrong. It's the same company that gets rid of Ethernet ports!!! Still hoping Apple gets their act together, so I can allow myself to buy a new MBP in Q1 2016 to replace my 2010 17" laptop. But I am afraid that Apple is unable to solve the UI lag: super hardware, inferior software. Not buying a maxed out MBP to get frustrated by the software. And yet there are millions of people that don't have the wifi issue, myself included. The UI lag that you mention was real when Yosemite was released, even on a Mac Pro. It's been 99% fixed now. I don't get frustrated by Yosemite and I seem able to get my work done. A native interface would defeat the purpose of security. If you have a native interface, how do you know nothing is being captured on the backend before being sent to Google. Not saying that Apple would do that but you see the problem. The point of a webpage is to know that you're dealing directly with a branded Google webpage on Google's own servers.